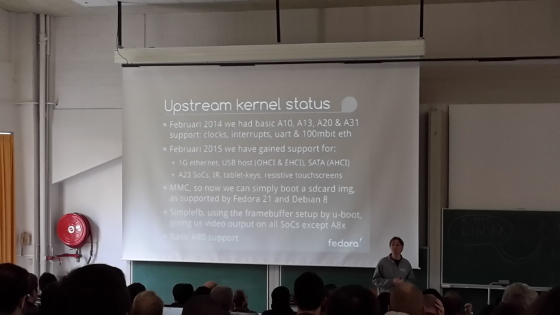 FOSDEM is the most popular annual event about free and open source software in Europe. It takes place in Brussels during the weekend of February and has a free entrance. In 2015 I visited it for third consecutive time. 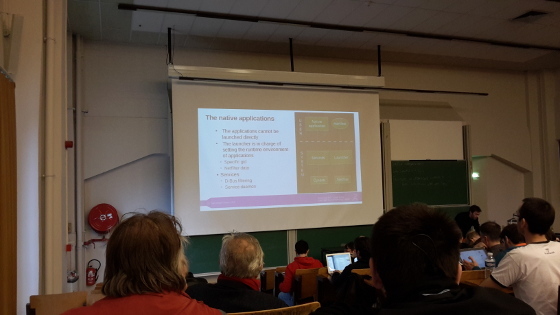 Thousands of people attended to this edition of FOSDEM. 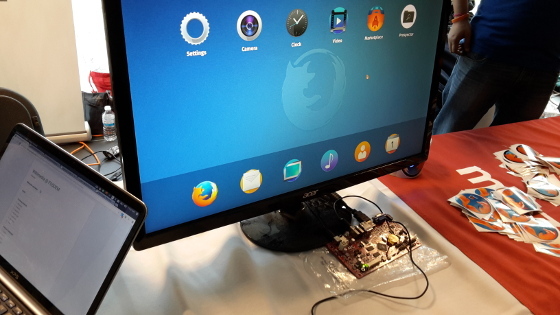 There were several interesting demos at the booths, including an ARMv7 development board with Firefox OS. By the way this year I spotted even Richard Stallman in the crowd. This first presentation that I visited was Upstream Allwinner ARM SoC (A10 / sunxi) support status by Hans de Goede at the Embedded room. This presentation provided information about the progress and the pending tasks related to development boards and devices with Allwinner SoC, aka Sunxi devices such as OLinuXino boards from Olimex, Cubieboard, Banana Pi, etc. At the moment mainline Das U-Boot boot loader is working with A10 and A20. The status of linux-sunxi kernel as well as ongoing efforts to support A80 and the mainline kernel were also discussed. The next talk at the Embedded room was about MinnowBoard MAX. 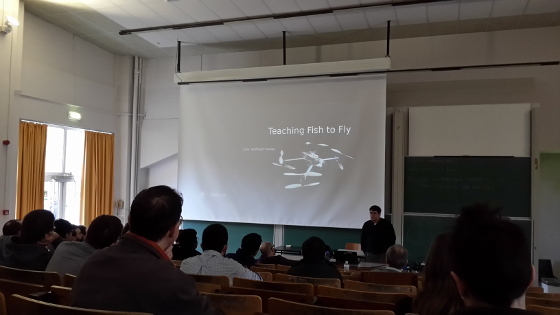 John Hawley shared his experience about teaching fish to fly. By the way he had a similar talk about a drone and MinnowBoard MAX during LinuxCon 2014. Definitely the most visited talk at the Embedded room during the two days was: Recycle your Android devices for anything: run real Linux on them. 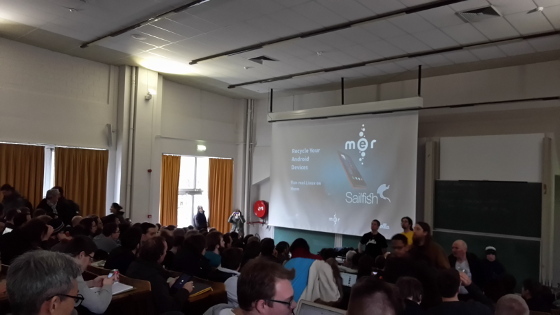 David Greaves works for Jolla and he shared their experience in booting Mer and Sailfish OS on existing Android devices through libhybris. This approach allows to work around issues with closed binary blobs and unknown device drivers on Android devices and to run Linux distributions on them. The next talk that I visited again at the Embedded room was about building a medical monitoring connected device with Yocto by Adrien Renault. At the end of the day I moved the room for Graphics where Samuel Iglesias explained how to test OpenGL drivers using free software. 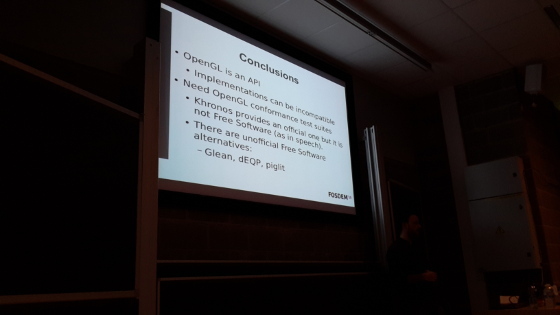 He analyzed several free and open source tools for testing and verification of OpenGL drivers such as Piglit, dEQP and Glean. The evening after the first day of FOSDEM was reserved for community meetings. Philippe Coval booked a cozy restaurant for the Tizen community meeting. Developers from Samsung, Intel, GENIVI, EFL as well as popular bloggers and independent contributors like me joined the event. Even a couple of students from France attended the event and showed interest in Tizen. Details about the event are available at TizenExperts and Tizen wiki. I spent most of the second day again at the Embedded room. 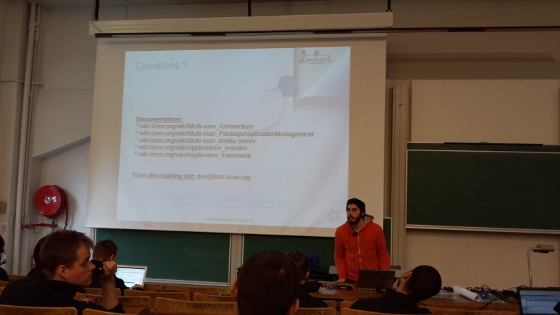 Dominig ar Foll was unable to come to FOSDEM due to other professional arrangements and he was replaced by a developer from Eurogiciel group for the presentation about adding advance connectivity and security to an embedded project. The talk offered general information about the Tizen architectures, including the usage of smack and cynara for security. I was not able to attend to the presentation by Stormy Peters with the attractive title Mobile == Web but definitely it must have been an interesting talk. Hopefully a video will be available soon. At the Embedded room Hauke Mehrtens provided practical advices for back porting a driver compatible with the mainline Linux kernel to older versions of the kernel. After that Daniel Stenberg spoke about Internet all the things - using curl in your device. Actually it was a talk in general about curl and almost nothing particular about Internet of Things. The next talk in the Embedded room was again about Tizen. I was happy to step on the stage and to share it with my friend Phil Coval, also known as Rzr. We spoke about the porting of Tizen to ARMv7 A10 and A20 SoC from Allwinner Technology, RK3188 and RK3288 from Rockchip, as well as to boards with Intel architecture. The open source hardware development boards Olinuxino from Olimex, Radxa Rock and Minnowboard Max were highlighted. At the end of the day I moved to the room for Internet of Things. Benjamin Cabe from the Eclipse foundation presented how to manage all the things, small and big, with open source LwM2M implementations. He explained the usage of Wakaama and Leshan for real use cases of machine to machine communication between Internet of things. Wakaama is implemented in C and is for micro controllers while Leshan is a server implemented with Java. The communication is based on CoAP. There was even a live demo. 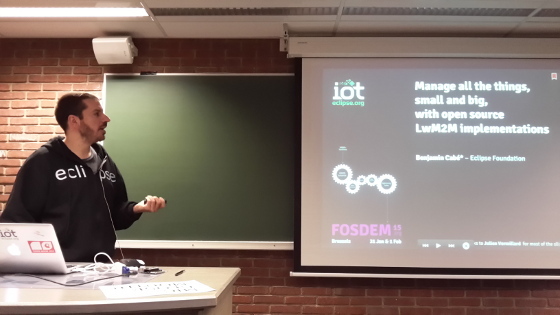 Manage all the things, small and big, with open source LwM2M implementations - FOSDEM 2015 from Benjamin Cab? Other topics from FOSDEM that caught my attention but I was not able to visit are: matrix.org (they had a talk and a lightning talk as well as a booth at K building), jit.si (lightning talk and a booth at K building), a lightning talk about Hack (new programming language based on PHP and developed by Facebook), Yatta (lightning talk), XMPP, Kodi, Ubuntu on phones and beyond, Firefox OS, HTML5 games, GPS watch made with free software and hardware.